András L. Pap (JD, M.Phil., Ph.D., Habil., D.Sc.) is Research Chair and Head of Department for the Study of Constitutionalism and the Rule of Law at the Hungarian Academy of Sciences Institute Centre for Social Sciences Institute for Legal Studies, a SASPRO-Marie Skłodowska-Curie Fellow at the Institute of Sociology of the Slovak Academy of Sciences in Bratislava, and a Professor of Constitutional Law at the Law Enforcement Faculty of the National University of Public Service, as well as Recurrent Visiting (Adjunct) Professor at Central European University’s Nationalism Studies Program. Currently he is on leave from Eötvös University (ELTE) Faculty of Humanities, Institute of Philosophy. He has been visiting scholar at New York University Law School’s Global Law Program, honorary fellow and visiting researcher at the University of Aberdeen Centre for Citizenship, Civil Society and Rule of Law, and Erasmus visiting professor at the University College Dublin, Faculty of Law. He lives in Budapest. His a member of several editorial boards, has given over 100 presentations at international academic conferences. He has taught over 60 different courses, 20 in English. He published six books and 6 textbooks and over 250 articles. His research interests include constitutional law, human rights, minority rights and law enforcement. 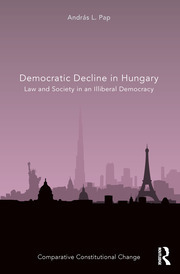 In the past years he participated, and in most cases acted as lead researcher, in a number of research projects commissioned by the EU’s Fundamental Rights Agency, the European Parliament, the Council of Europe, the Sixth EU Framework Programme, the UN, the Open Society Justice Initiative, the International Centre for Democratic Transition, and OTKA, the Hungarian National Scientific Research Grant. He is a member of several international research networks. He was invited speaker and expert at the UN’s Forum on Minority Issues and trainer at the International Law Enforcement Academy. He often served as expert for courts in the UK. He is a member of the Hungarian Helsinki Committee and regularly works with human rights NGO’s.